Give, Eat, and Live is a selection of poems translated from the 12th century Tamil poet Avvaiyar, arguably one of the most important female poets in Tamil's two-thousand-and-five-hundred years of literary history, and certainly one of the best known, of any gender. Although people across the state of Tamil Nadu know many of her works by heart, she has received little attention outside India, owing largely to the lack of decent translations. 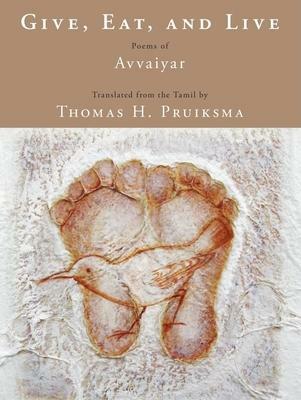 The one comprehensive work in English, Avvaiyar, a great Tamil poetess, by C. Rajagopalachari (Bombay: Bharatiya Vidya Bhavan, 1971), has long since been out of print and renders Avvaiyar's poems in accurate but wooden translations. This book, by contrast, seeks to render her finest songs in a supple and poetically charged English that allows both her intellect and poetry to shine. The selection includes poems from two of Avvaiyar's major books on the good life, Muturai: The Word that Endures, and Nalvali: The Right Road. It also includes a generous sampling of poetry that was written separately and later gathered into collections. All of them use a Tamil form called venpa, dating back to the late Sangam period (first to third century C.E.). Though they speak of ethics, they do not cease to be poetry, employing imagery drawn from the Tamil landscape as well as a deeply musical line. These are poems meant to be chanted and sung. Many of these poems have been published individually, not only in India by the country's leading journal of Indian literature in translation, but also by the Temenos Academy in London. Give, Eat, and Live, in turn, will bring her work the wider attention it has long since deserved. Both aficionados of Indian literature and lovers of poetry alike will savor this first literary translation of one of Tamil's best loved poets. Thomas H. Pruiksma is a writer, poet, and translator from Seattle, Washington. His other books include A Feast for the Tongue: Forty Servings of Spoken Tamil with Helpings of Equally Spoken English, co-authored with Dr. K.V. Ramakoti, and The Body and the Earth: Notes from a Conversation, with the artist C.F. John. When he's not reading or writing, you can find him working in the garden, performing magic, and making music with family and friends on Vashon Island, where he now lives."